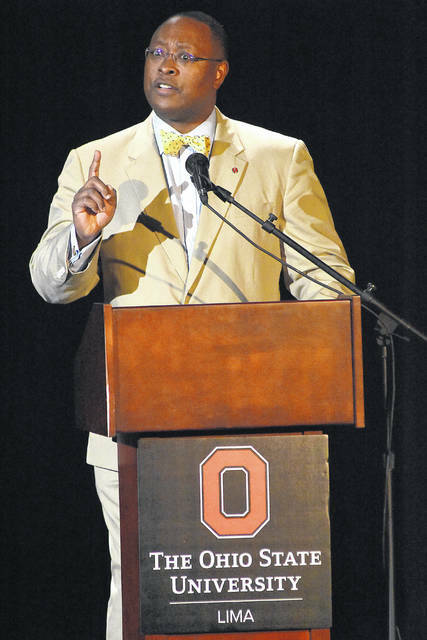 Dr. James L. Moore III, Ohio State’s chief diversity officer, talks about the role of diversity in the classroom and teaching Monday at Martha W. Farmer Theatre for the Performing Arts in Reed Hall on the OSU-Lima campus. The fight for diversity and inclusion is not a short-term goal despite the rhetoric of today’s politicians. “There is a lot of rhetoric that’s going on across the nation. Unfortunately, I wish people could vent some of that rhetoric and realize that some of the rhetoric, their circumstances are not going to be improved based on some of that rhetoric. Regardless of who might be in the White House, what side of the aisle you may embrace, diversity and inclusion is a long haul (goal),” Moore said. There is still much to do before diversity is reached.